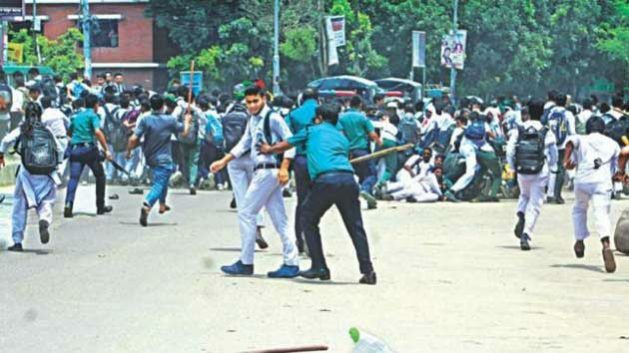 Aug 7 2018 - The European Union has expressed concern over protest and violent clashes in Dhaka that triggered since deaths of two college students in road crashes. In a statement released today, the European Union heads of mission to Bangladesh called for remaining calm and have respect towards the right to peaceful protest. “We expect all sides to remain calm and to respect the right to peaceful protest. Incidents of unlawful or disproportionate violence or action against protestors, journalists or others need to stop; those that happened must be investigated and perpetrators held to account,” said the statement of nine envoys based in Dhaka. The school-children’s protests highlighted fears over road safety and the enforcement of laws and regulations on the roads in Bangladesh, it said. The Government’s recognition of the need for action is a welcome step and we therefore expect further Government action to address this without delay, it added. UN Youth Envoy Jayathma Wickramanayake has lauded the student protests. The embassy published a post on its Facebook page today in this regard. 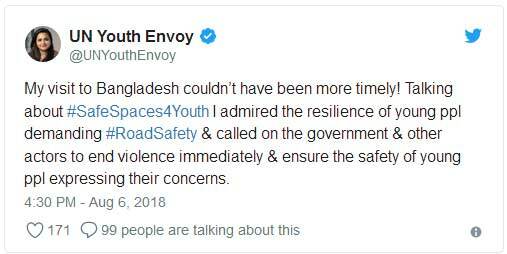 “Norway deeply regrets recent outbreaks of targeted violence against peaceful, student-led demonstrations in support of safer roads in Bangladesh,” the statement read. In the statement, the embassy also expressed admiration for students and schoolchildren for exercising their democratic rights of assembly and free speech. “They represent strength, not dangerous discord,” the post added.